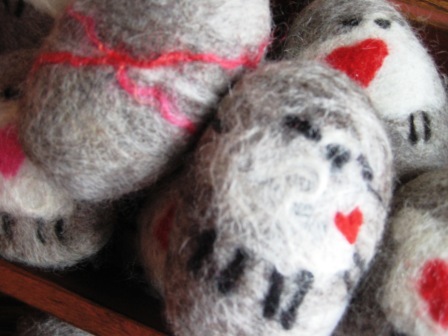 Wet felting – good clean fun. Finally! 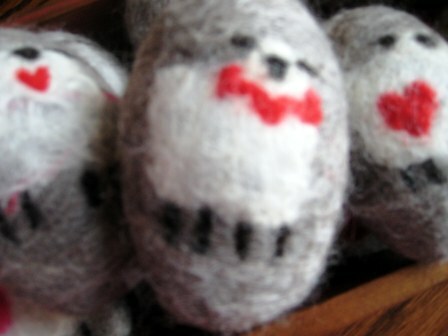 Lots of fuzzy soap in sheep’s clothing, built-in wooly wash cloth felted soap! Atten—tion! 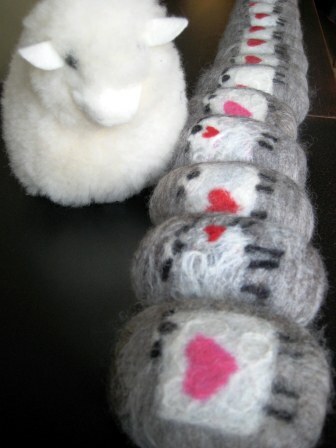 Sending a little ‘I ♥ love ♥ ewe’ your way! 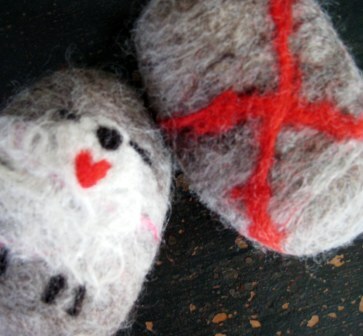 An easy wet felting project. You’ll need a fav bar of soap and any natural or dyed/colored wool roving or batt. Bits of wool locks, staples, mohair, novelty yarns add interest and texture! Wrap the wool roving neatly around the soap until adequately covered, adding bits of this ‘n that for interest if desired. Then comes the felting – alternate hot & cold water, working the fiber rigorously until felted. 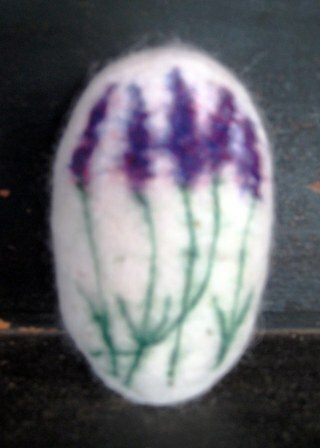 Once you have the hang of it, needle felt an image on your next bar of felted soap, BEFORE you wet felt it! Lavender is a gardener fav! 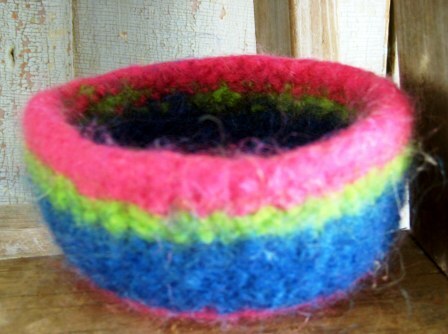 A bit more felted goodness…and a great stash buster for all those odds ‘n ends! This project was knitted first, and then ‘felted’ in the washing machine. This entry was posted in Projects, Sheep/Fiber and tagged felt, felted soap, fiber art, folk art, needle felting, prim, Sheep/Fiber, sheepy, wet felting, wooly soap by Sheepy Hollow Farm. Bookmark the permalink. Woot Woot! I’m glad you find inspiration here! Felting soap is a fun project. It’s a springboard to ‘resist’ felting (the soap provides the ‘resist’). 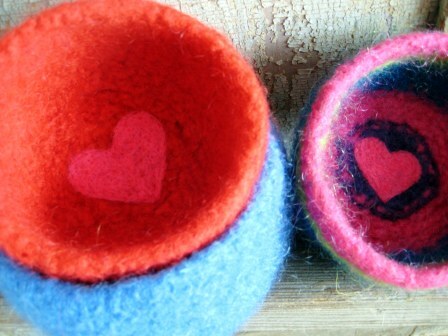 You can make hollowed out vessels, seamless, no-sew items such as slippers, hats, etc. But, that’s getting off-topic! Any soap will do… I don’t use my hand-made soap, it sells well on it’s own. Why cover it up? If YOU have a fav bath soap, begin there. I use a variety of different soaps – for their shapes & scent, some I melt & pour myself. I look for all-natural qualities. For a beginner felter, I like to use YARDLEY lavender soap because it has rounded corners (vs. a square bar of soap). Meijers carries it (occassionally on sale) and I’ve found it in Dollar Stores too. I even use small guest bar soaps that hubby brings home from job-related travel. Experiment with a few different soaps: castile soaps are nice too. Good luck & let me know how it goes! This is so awesome Jenny! 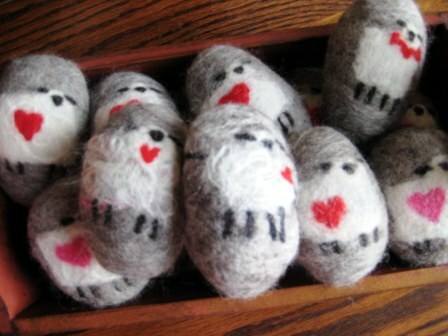 This is my next modality I want to play with now that I am getting good with needle felting. So much fun! Hi Jenn! I suggest you begin with wet-felting in ‘the flat’, so you can ‘see’ how the wool/fiber reacts to manipulation. 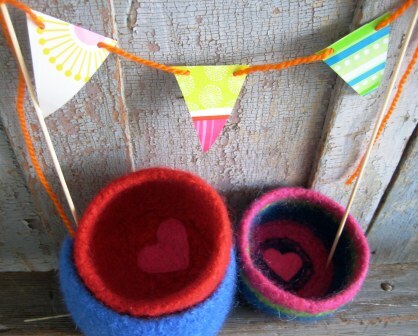 Next, try felting with a ‘resist’… whether around a baloon, ball, stone (or soap) to create a vessel, bowl, boot… I L.O.V.E. wet felting! TOO MUCH FUN!